A time-lapse video of Ben Nevis, Fort William, Scotland from Andy McKenna on Vimeo. Our neighbourhood is a rural one. Ben Nevis is right in front of our property. Most guests who come to stay enjoy a stroll along our country road. There is a really nice walk down to the River Lochy which is popular with fly-fishermen. Just along the country road from Cedar Lodge are two well-stocked trout ponds and you can hire fishing gear at Torlundy Farm. The Ben is often reflected in these ponds and the scene is spectacular. 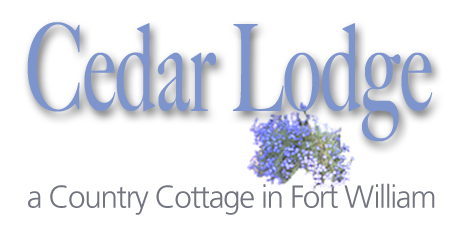 The video below was made from Cedar Lodge on the afternoon of 12th December 2010, through the night and just before the sun rose behind Ben Nevis on the morning of the 13th. This is the view you can see from the front of our house and from our deck. On the afternoon of 12 December 2010 we began filming the end of a beautiful day in Fort William and specifically a scene of Ben Nevis, Carn Mor Dearg and Aonach Mor mountains from Tomacharich just outside Fort William. A rising moon and the first stars give way to a moonlit night and a celestial heaven with meteorites, commercial aircraft and interestingly the flights of an RAF search and rescue mission around the north face of Ben Nevis. This short film ends as the winter sun very slowly rises behind the mountains around 10 am. The original soundtack on this short film was produced by Miriam Iorwerth.